Here’s How Shahid Kapoor’s Daughter Misha Has Already Made Deepika Padukone Her Fan! Deepika Padukone reacts at Shahid Kapoor’s daughter Misha’s video! Star kids have nowadays become the talk of the town. Whether it is Amitabh Bachchan’s granddaughter Aaradhya Bachchan or Kareena Kapoor Khan’s son Taimur Ali Khan, everyone can’t stop but gushing about these little munchkins. And giving them a tough competition is Shahid Kapoor and Mira Rajput’s daughter Misha Kapoor. The little kid is an absolute bundle of joy. It was last year on August 26, when the couple had welcomed their first kid and since then we have been getting some adorable glimpses of the girl. While the young B town stars like Alia bhatt and Kriti Sanon liked the video, it was Shahid’s Padmavati co-star Deepika, who couldn’t help herself commenting with the love struck emoji! Isn’t that cute? We guess Misha has already made a fan following for herself! 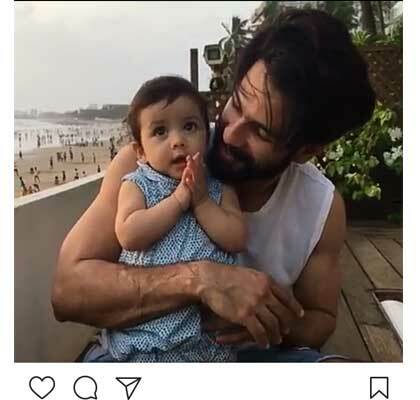 Earlier also, Shahid has shared some adorable pictures and videos of his daughter. In fact, there was one in which Misha could be seen trying to follow her father’s dance moves. Well, on the work front Shahid Kapoor and Deepika Paduone are currently working together in Sanjay Leela Bhansali’s Padmavati. The actress will be playing Queen Padmini in the film, while the actor will be playing the role of Rana Rawal Ratan Singh, Queen Padmini’s husband. The film also stars Ranveer Singh, who will be playing the role of Alauddin Khilji. Padmavati is expected to release in Diwali, this year. Previous articleVirat Kohli CONFESSES How Girlfriend Anushka Sharma Has Changed His Life! Next articleDon’t Miss Salman Khan’s Nephew Ahil’s Reaction After Watching Tubelight Trailer!